Today’s Kickstarter Spotlight will be focusing on a product that to many, an English localisation seemed like a far-fetched dream. This was due to the amount of text, depth and complexity the game contains, despite the game’s critical acclaim in Japan. 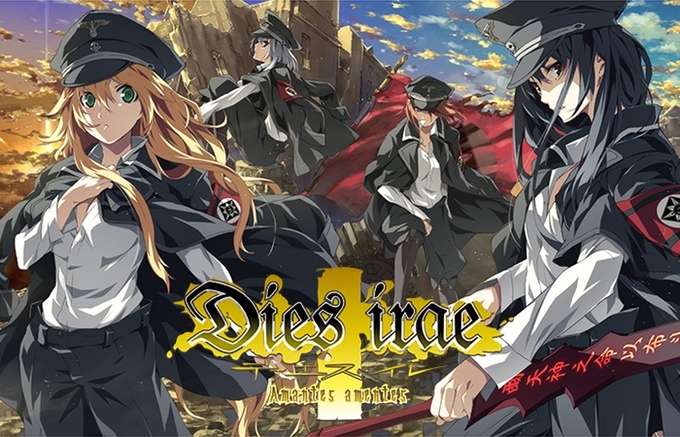 Dies Irae recieved several versions over the years in Japan on PC, and then evantually for PSP in 2011. Now this definitive PSP version, Dies aries ~Amantes amantes~ is now being targeted for an official English localisation for PC by Light and Regista. Like many text heavy visual novels, they are hoping to be successful on Kickstarter with a funding goal of $160,000. This isn’t new for the series, as the game’s anime adaptation was also made with the help of crowdfunding in Japan. This anime adaptation will be coming westward in 2017, and if this Kickstarter is successful, the VN will be as well. The aim is for the game to be released DRM-free on Steam in May 2017 if successfully funded. The game would be released in two parts, mainly due to the sheer length of it all and that the various character routes were finalised at different times during the game’s development. Before we begin, here is a promotional movie that has veen subtitled by Light, more to set the scene than anything else. It was released a while back, but has now been subtitled in English. On the eve of Berlin’s collapse, a group of men and women carried out a certain ritual. To them, suffering defeat in the war meant nothing. If anything, the countless lives lost in the battle served as a catalyst to their sacrificial ceremony. Whether or not their attempt bore fruit ― not a soul knows. Following the war, they faded from sight, mind, and eventually into the realm of myth. A gameplay preview has also been released by Light, so prospective backers can get a better understanding over what product they would get. This 45-minute clip shows the prologue of the game translated with English text. This is a visual novel, so it will be mostly reading. The features that are being added to the PC release include 16:9 support, an expanded resolution to 1280×768 (with support for others as well), and reworking of the various effects. Furthermore, the game’s compatability will be updated to all Windows PCs that have version 7 or newer. With regards to censorship and 18+ content – scenes of graphic violence that appear in the orginal Japanese version will be uncensored so they “will appear as the creators originally intended them.” Furthermore, although the Steam version will be an all-ages release, those that want the 18+ content will be able to get it via a free patch available to all backers. The details of this patch have yet to be released. As for the localisation, it is being worked on by experienced translators in the VN market, including Reading Steiner and Qaenyin, whom both worked on the original Steins;Gate and more recently, Valkyrie Drive: Bhikkhuni. Other team members include the character designer G-Yuusuke, whom’s past works include Kajiri Kamui Kagura and the Soushuu Senshinkan Gakuen series, and Takashi Masada whom also worked with G-Yuusuke on Kajiri Kamui Kagura. Now for the rewards. $1 will get you onto BackerKit as well as a thank you letter. $35 will net you a digital copy of the game upon it’s Steam release. $45 will add a digital soundtrack. $50 will net you a DRM-free all-ages physical copy of Dies aries ~amantes amantes~ at a discounted price from the planned RRP of $70. These rewards, and more, will stack the more money you put forward. Other rewards includes a physical soundtrack, badge straps, t-shirts, name in credits and replica shikishis. A PS Vita version is also promised as a stretch goal, however the details about this are scarce. The target amount isn’t listed on the Kickstarter and there are currently no plans for a physical version. Finally, before we close, here’s the game’s opening movie, released by Light. For more information including characters, an FAQ and the remaining reward tiers, likewise if you decide to back the project you can check out the Kickstarter page here. If you would like to back, you have until 1:00 AM GMT on 13th January, 2017.